One of my favourite things to do is to take photos of bride in her wedding gown. The amount of dreaming each girl does about their wedding day is impressive in scale and this is one of those moments in life where they look their absolute best. Being able to capture environmental portraits, and beautiful pictures to keep forever is an awesome privilege and such fun to do. Out in the desert is a great place to take pictures because most often the weather is beautiful! Because of it's arid nature the sun is out, the light coming back off the ground is bouncing beautifully and it illuminates people as well as any other type of location. 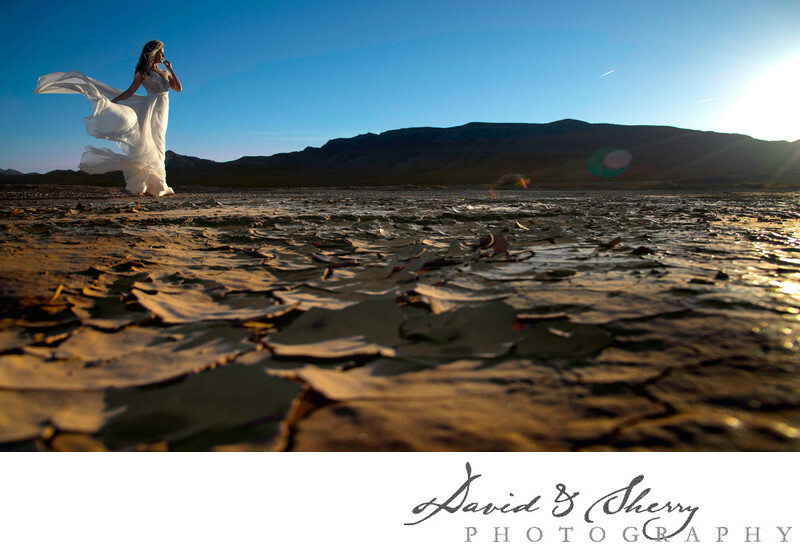 So we love taking our couples out into the desert to take photos. This pic was taken just south of Las Vegas, NV at a little spot along the highway. We then crouched down to get some of that crackled earth into the frame and composed it in such a way so the leading lines bring your eye right into the bride. It's a beautifully composed image and I love the way the bride's dress is flowing in the wind with the sun kissing her face.